This tower is three full tiers of deliciously shareable milk and dark chocolate treats - with caramels, solid chocolates, nut butter gianduias, and of course - classic Swiss truffles!  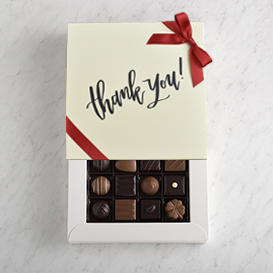 This gift is the perfect way to show your appreciation! 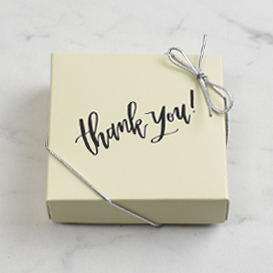 Bottom Tier: A One Layer Deluxe Collection Box - 16 pieces of our exclusive best sellers, finished with a fun Thank You Gift Topper. 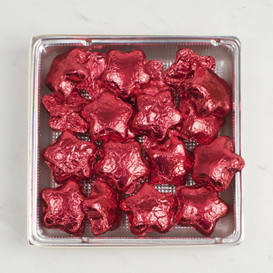 Middle Tier: A half-pound box of creamy Milk Chocolate Stars, wrapped in bright, shimmering red foil. 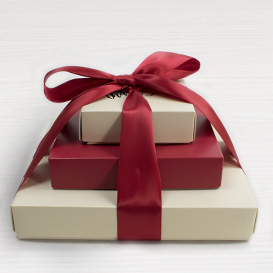 Top Tier: A special Four Piece Box filled with a variety of our most popular flavors, topped with a Thank You Gift Topper.